GoDaddy is an SSL certificate authority that sells web hosting, domain names, SSL certificates, and other web services. 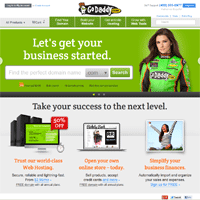 GoDaddy was established in 1997, and is headquartered in Scottsdale, Arizona, USA. The GoDaddy SSL certificate reviews listed below will help you determine whether GoDaddy is a good company to buy SSL certificates from. The reviews have been verified to be from real GoDaddy customers. If you want to compare GoDaddy SSL certificates with certificates from other SSL providers, use our SSL Wizard. If you have ever purchased or received a certificate from GoDaddy, please post a GoDaddy SSL review to let others know what to expect. Anyone who applies for an EV SSL must pass a rigorous vetting process that no hacker or thief could survive. If you have an Extended Validation EV SSL Certificate, customers know you're legitimate.